Welcome to the Hawthorn class page. Here we will be sharing pictures and information so that you can see what we've been learning in school and share our adventures! We had an amazing learning experience at the Eden project on Friday. All the children became Rainforest rangers. Enjoy the photos and please talk to the children about all the super learning that took place. Today in Hawthorn Class we welcomed Mrs Brinkworth, an engineer with Babcock, who showed us some amazing experiments we could try at home. Please ask your children what they did! We learnt about structures, construction, gravity, molecules and air pressure. Please watch Engineering Plymouth u tube. It is inspirational! Today we wrote a class Cinderella story with a twist! Please read our entry to the school competition. Well done to all the children in Year 4 who have achieved their table caps this term. I'm sure next term we will have many more children who can instantly recall all the table facts to 12 x 12. Emily came to school today to show us her new wheel chair. She answered lots of questions about how she uses it and gave us a great demonstration. The children asked lots of questions and were really respectful. What a fantastic start to Hawthorn Class. Today we voted for a school parliament representative. Everybody had a chance to vote. Congratulations to Elle and Sonny who had the most class votes. Runners up were Sophie and Finley. Well done to Sophie S for the winning poem in our class for then Beyond the Horizon writing competition. And the decks go creek, creek, creek. And the parrots are all called Peek. And you just can't change it to break! A big thank you to Mr Smith for visiting year 4 today and sharing artefacts that belonged to his grandfather during WW2. Thank you so much Mr Luscombe (Toby's Grandad) for visiting year 4 today and telling us all about life as an evacuee child. Year 4 had an amazing day learning about life in WW2. Code breaking, marching, life as an evacuee, sirens and much more. In our English this week we have been performing, reading and writing poems. 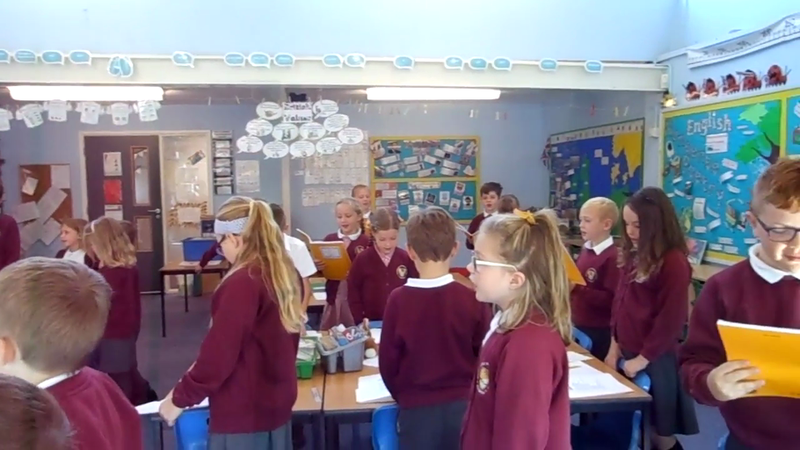 Watch our class performance of the Ning Nang Nong by Spike Milligan.